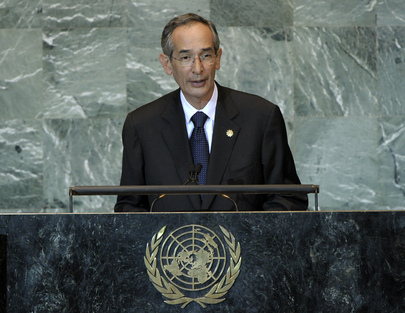 ÁLVARO COLOM CABALLEROS, President of Guatemala, said that despite the global financial crisis, a national political crisis in 2009 and three major natural disasters, his Administration had provided social services to the poor, reduced violent crime by reforming the security sector, and regained control of territories dominated by narcotic drug traffickers. It had adopted wide-ranging policies to ensure greater Government transparency, including the creation of the Transparency Secretariat and the adoption of a national law on transparency in public information and public expenditures. It had also promoted the use and availability of renewable energy and developed two economic corridors that had improved living standards in poverty-ridden regions. Moreover, the Administration had pursued a dynamic foreign policy that had bolstered Central America on the world stage, he continued. It had given greater power to municipal governmental authorities and faithfully respected the independence of different branches of the Government. Still, much work remained to be done towards eliminating poverty and raising the standard of living, particularly among children, single-parent households and indigenous communities. He said that his Government had also made staunch efforts to end the use of Guatemala as a transit point for illicit trafficking in drugs and human beings. Alongside other members of the Central American Integration System, it had adopted a subregional security strategy that had been presented to the international community at a conference on security held in Guatemala in June. Noting that his country grappled with at least one major natural disaster every year, due largely to climate change, he called on humanity to “close ranks to defend our common habitat: our planet”, expressing disappointment that progress towards that goal had been minimal thus far. He called on the international community to redouble efforts to adopt tangible action plans during the next Conference of Parties to the United Nations Climate Change Conference, to be held in Durban, South Africa, in December. Thanks to the Government’s active foreign policy efforts, he said, he was confident that within three weeks it would achieve its aim of winning election as a non-permanent Security Council member for the next biennium. Guatemala was fully committed to strengthening preventive diplomacy as well as United Nations conflict-prevention tools. He noted that while his country accepted sanctions adopted collectively by the Council, it rejected such coercive measures when implemented unilaterally. In that regard, he called on the United States to end its economic embargo against Cuba. He also expressed support for the creation of a viable, prosperous Palestinian State, living in peace and harmony with Israel. Reiterating his country’s commitment to re-launching the regional integration process of the Central American Integration System, he said Guatemala also supported the creation of the Community of Latin American and Caribbean States. In addition, the Government had taken steps to resolve the age-old territorial dispute with Belize by signing a special agreement that would permit both countries to seek a juridical solution through the International Court of Justice. The Guatemalan Congress had approved the special agreement, which would now be put to a national referendum.